The theme of the bar is portrayed in the first design as the Spiral of Time. The Spiral of Time emerges from the spiral found in a fossilized Ammonite. There is reference to an astrological clock(three arms) and the three pendulums of a grandfather clock. The three skulls portray the evolution of man and serve as a “Vanitas” symbol which has been used as such in many disciplines over centuries. The top of the design features a sundial and refers to ancient sites all over the world which used the sun to tell time. The overall composition of the design is based on the number eight which is the number of perfection and infinity. In mathematics, the symbol for infinity imitates an 8 lying horizontally. It symbolizes totality and the ever-spiralling connection between creation and evolution. Kitco offers these 1 oz gold Spiral of Time bars for sale on our online store, with competitive gold prices. Buy 1 oz gold Spiral of Life bars online from Kitco today. Not everyone knows that they can store their 1 oz Gold Spiral of Time Bars safely and securely with Kitco Allocated Storage. With Kitco, customers are offered options for gold vaulting that are fully insured, allocated and segregated. Some of the world's most secure gold storage facilities are part of Kitco's network of top-tier gold vaults. Our gold storage vault network includes gold vaults located in Canada, Hong Kong and the United States (a COMEX approved gold storage vault). Under certain conditions, Cayman Islands gold storage is also available. Find out if our Global Precious Metals Storage Solutions are right for you, by reading more, or contacting our precious metals specialists. 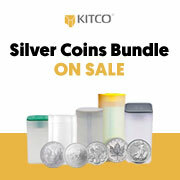 Kitco can help you keep your gold and other precious metal bullion purchases secure. Metal Concentrators (MC) has earned a reputation for being an industry trendsetter. In South Africa, MC is considered a pioneer in the field of refining, manufacturing and supplying precious metals. The company was established in 1989, and gives technical support to South African Jewellery manufacturers. Metal Concentrators has a team of representatives who serve the South African precious metals industry, and has refineries in Johannesburg and Cape Town and a satellite branch in Durban. The South African Diamond and Jewellery Regulator and the South African Reserve Bank have both given Metal Concentrators permission to produce and sell minted gold, silver and platinum bars. MC was the first company to receive this permission. Fully compliant with the provisions of the Mining Charter, the Company’s operation was the first South African company to receive dual certification (Chain of Custody and Code of Practice Certificates attached) from the Responsible Jewellery Council in London England. This certification acknowledges high levels of integrity in gold trading. In compliance with the EU Nickel Release Standard, Metal Concentrators was also the first company in South Africa to formulate and produce nickel-free alloys. The growth of the South African jewellery industry has been supported by Metal Concentrators substantial contribution and support of the goals of the Jewellery Manufacturers Association. Together with Anglo Platinum, the company initiated the Platinum Design Competition, known as ‘’PlatAfrica’. Now, Metal Concentrators is focused on another goal: The Evolution of African Wealth. What does this mean to MC? To expand South Africa’s precious metal footprint in the rest of the world through the world class manufacturing of bullion and heritage products which represent South Africa with dignity and respect. To create nation building precious metal products accessible to all South Africans. Metals Concentrators is the only South African refinery which buys back its own products in South Africa, which radically diminishes the risk to the end consumer. Metal Concentrators is a company which understands the need of the consumer to expand and store wealth by buying back at any time their own precious metal products at market related rates. The new investor who wants to start investing in precious metals can trade fearlessly with Metal Concentrators. Why buy 1 oz Gold Spiral of Time Bars from Kitco?